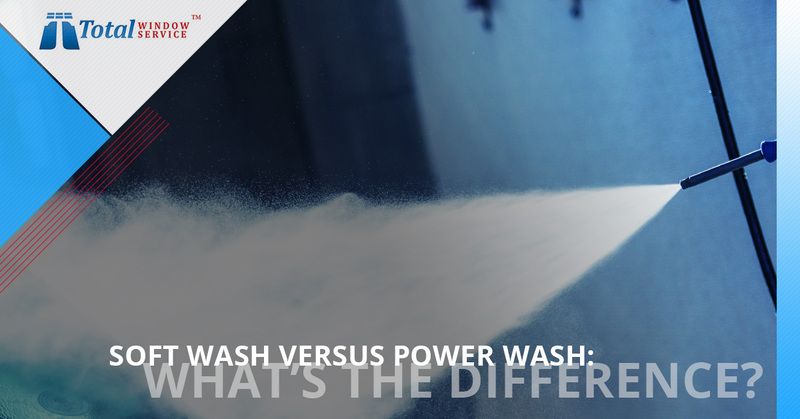 Soft Wash Versus Power Wash: What’s the Difference? Some individuals, and even some businesses, use the terms soft wash, power wash, and pressure wash interchangeably, but technically, there’s a difference between each technique. In this blog, we want to go over what these differences are and clear up any confusion you may have regarding these similar terms that refer to somewhat different processes. The point of power washing is to remove dirt from the surfaces of buildings. This could be walls, roofs, facades, and even windows. Power washing makes use of heated water to get rid of everything from dust and dirt to mold and mildew. Why is hot water used? If you’ve ever washed dishes in cold versus hot water, you’ll likely know the answer already. It’s more difficult to break up grease and other dirt in cold water. Hot water gives you extra cleaning power! It’s the same when power washing walls, roofs, decks, driveways, and windows. Water that’s applied at higher temperatures provides extra fighting power to break up dirt and dissolve grease. Power washing needs to be done by a professional cleaner who is experienced with using these powerful machines. If you leave the job up to an amateur, someone could get hurt, or you could ruin parts of your building or other property. As the name implies, a great deal of force is used in order to clean walls, roofs, decks, patios, driveways, and more. We don’t recommend that you do this job yourself; hire a reputable company that knows what it’s doing. A far gentler approach is to go with soft washing, which is an environmentally safe way of using chemical solutions to clean roofs and building exteriors. Instead of blasting dirt from outside walls, built-up grime is gently dissolved using chemicals that remove filth without damaging whatever the surface is built from, whether it’s brick, metal, limestone, or any other material. Especially with older or historically significant buildings, a soft wash is the way to go. Care must be taken to use chemicals that will not etch or harm in any way the sometimes delicate or vulnerable surface. This type of cleaning requires a great deal of expert knowledge and experience with a wide range of building surfaces and cleaners to clean effectively while protecting the building from damage. As with power washing, a soft wash is not something that you want to do yourself. First of all, it’s critical to know which cleaners to use, and which ones to not use. Not only can you inadvertently damage the features of your exterior walls, you can also inhale dangerous fumes if you don’t know what you’re doing. Again, leave this task up to the professionals! As part of the soft-wash procedure, the cleaning solutions that are applied need to be removed thoroughly through an appropriate rinsing system. Once the job is done, your building will sparkle like new! Finally, there’s the pressure wash method of getting a building facade clean. This approach is similar in many ways to power washing, but it involves force alone, not temperature. With pressure washing, the water is not heated; it can be cold or at room temperature. It’s the pressure that removes the built-up grime, not hot temperatures. Other than this distinction, there’s not much difference between a power wash and a pressure wash, at least to the untrained eye. But since force is used exclusively, it’s important to understand what types of surfaces can handle this type of wash, and which surface might be damaged by it. Because it takes a specialist to know which surfaces can safely withstand the high pressures of this type of wash, and which can’t, and because high-powered machinery is used to clean the buildings, it’s important that you hire a company that has plenty of experience with this type of washing technique. The company needs to train its technicians on the proper use of pressure wash equipment to avoid mishaps and to ensure the job is done right. 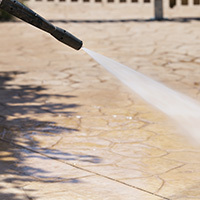 Often, pressure washing is reserved for patios, driveways, sidewalks, and decks, but this technique can be used on building walls as well, in some cases. Now that you know the differences between pressure, power, and soft washes, take a look at the exterior of your property. Does it need a good cleaning? If so, get in touch with Total Window Service in New York City. In addition to offering window-washing services to commercial and residential clients, we provide soft washes, building facade cleaning, power washing, and pressure washing to keep your property looking great. Get in touch with Total Window Service of NYC for any type of building or window cleaning job. We can also do chandelier and light fixture cleaning for you, insulate your windows, add privacy or solar film, or restore any damaged glass you may have. We truly do it all! For any type of window-related or building surface cleaning services, reach out to Total Window Service today. One of our qualified representatives will be happy to discuss your project with you and provide you with a free, no-obligation quote. If you need any of these jobs done, call Total Window Service of New York City today!